"We're through," I cried out one cool, foggy morning. "I'm leaving you." "Leaving me? Impossible! You've said it a million times, but you'll never go. Everyone knows you're going to live here forever." "I'm going," I replied, slightly more than half-heartedly. "Just watch." And so began the break-up of a beautiful, complicated 15-year relationship. We've been through a lot, San Francisco and me -- the earthquake, the technology revolution, El Niño. We've watched favorite restaurants come and go. We've downed countless cosmopolitans. We've shared foggy Fourth of Julys, watching obscured fireworks turn gray mist into red, white and blue -- oohing and aahing the fog-muffled kabooms. We celebrated the 50th anniversary of our beloved Golden Gate Bridge. We proudly watched Chris Isaak go from Local Ham to Big Star. We jumped for joy as Joe Montana and Jerry Rice gave us the Team of the '80s. We watched a ballpark finally get built. Yes, we'd seen much together, San Francisco and me. But it was time to go. "You're leaving me for another city, aren't you?" San Francisco accused. "Don't lie -- which one?" "Portland!" screamed San Francisco. "That rain-soaked, Subaru-infested, fleece-wearing, tree-hugging, minor-league town? Have you lost your mind?" The fight got down and dirty. "I still love you," I said, "but we can't go on living together. You've become too demanding, too high-maintenance. When we met, you were a quirky, navigable city. But you changed during the dot.com-boom. Now you're nothing more than a high-rent, crowded, rat race with a view. You've become ..." I paused for effect "... Manhattanized." San Francisco sneered. "And what do you know of high rents? You've been coasting on my rent-control policy for years." It was true. I'd indulged in a spacious one-bedroom for under $1,000 a month -- for longer than I cared to admit. But what once felt like a gift now felt like golden handcuffs. And for this I resented San Francisco. "Keep your rent control," I shot back. "I'm sick of being held hostage by an apartment. Besides, I can get more for my money in Portland -- a balcony, a fireplace. Maybe even afford to buy. "And another thing: your parking stinks. You used to cough up a spot after 15 minutes. Which wasn't great, but I dealt with it because I loved you. Lately I circle for 25, sometimes 30 minutes -- for nothing! In Portland, I find downtown parking almost right away." Then I struck my final blow. "And what about all those summers you've denied me over the years? I'm not talking a wet, windy 62 degrees in August. I'm talking real summer -- where it hits the 80s and people sit outside at night in short sleeves. They do that in Portland." "This isn't about parking. And it's not about cold summers either. This is really about those Internet stock options you chased for two years that never panned out. Your house down payment went the way of the dot.bombs. Admit it -- you just can't afford me. It's you who changed." A cruel blow, but true. 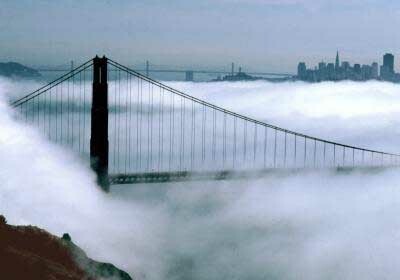 I did love San Francisco, but it had become too high-priced. And so I left for Portland -- a magical city of trees and rivers, distinctive bridges, affordable housing and no sales tax. A fine and lovely place. However, I'd be lying if I said I didn't miss San Francisco in spite of its ways. I think often of the good times we shared, its unique beauty and its cosmopolitan tastes. Regardless of our past, I look forward to keeping in touch. Perhaps we'll do lunch, or have a weekend fling for old times' sake. Who knows, we may even get back together one day. But meanwhile, as I scan Portland's skyline from my historical balcony overlooking a yet-to-be-explored neighborhood, I can't help thinking that one bridge really does lead to another.